A brined Thanksgiving turkey has been my brother Greg’s tradition for years. He swears it’s the only way to go. So when Holland House asked me to develop brine recipes with their cooking wines, I was excited. Why? Cooking wines are a natural for brines because they contain salt. And… they add fabulous wine flavor to meat and poultry that cannot be had with plain water-salt brines. With lots of kitchen testing, I created a unique method for brining with Holland House. I call it a “flavor infusion.” A small amount of richly seasoned brine is heated, cooled, and stirred into the rest of the brine. A much faster route than traditional hot-start brines. This concentrated flavor then infuses the poultry or meat as it brines. The result? Succulent chicken with delicious wine overtones. I am totally sold on using cooking wines and this stream-lined method for brining. So get cooking simply, with brines! Want to know more about brines and how they work? See more of my Holland House recipes or ask me directly by clicking on “comment” below this post. Your contact information is never used for anything other than my response to you, and other subscribers will reap the benefits of our exchange. Brine time 1 to 2 hours. Grilling time 10-14 minutes. Makes 4 servings. Pour about 2/3 cup cooking wine into a glass. Stir in thyme and garlic. Microwave on high 1 minute. Cool to room temperature — at least 30 minutes, stirring once or twice. Or place glass in an ice water bath to chill faster; stir occasionally. Meanwhile, stir salt into remaining cooking wine until completely dissolved. When cooled, stir brine “flavor infusion” and add to remaining cooking wine; stir. Place chicken in a sealable plastic bag or non-metallic bowl. Pour brine over chicken so it is completely submerged. Cover and refrigerate 1 hour if chicken is thin, 2 hours if it is thick (1-inch or more). Preheat grill to medium heat. Drain chicken and discard brine; do not rinse chicken. Grill thin chicken breasts 6 minutes (8 minutes for 1” thick breasts) over direct heat with cover closed. Turn chicken, close cover, and grill 2-4 minutes more (about 4 minutes more for thick breasts). Serve immediately. 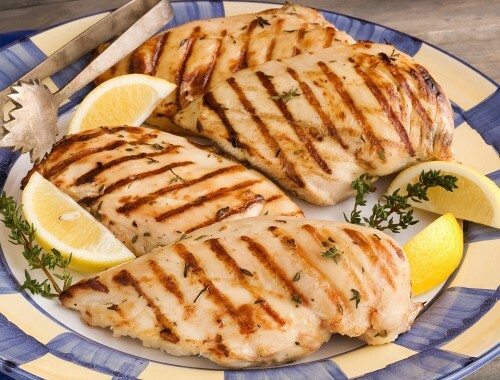 For this grilled chicken recipe use: 2 Tbsp. Diamond Crystal kosher salt, or 1 Tbsp. + 1/2 tsp. Morton kosher salt, or 1 Tbsp. Morton table salt. If parts of the chicken breasts are more than 1-inch thick, use a sharp knife to cut the thick end horizontally to make a smaller second piece. This ensures more even brining and cooking. If you cannot find Holland House “white cooking wine with lemon”, add a teaspoon fresh lemon juice to Holland House white cooking wine. I’m trying it tonight! can’t wait. Cool bro! You’re my brine master:o) Let me know how it goes. If you do try it, Kim, let me know.